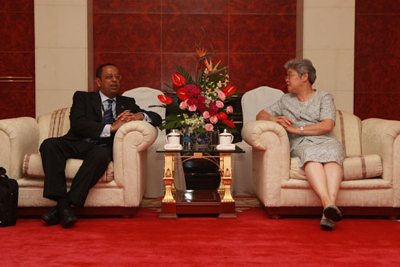 Tang Wensheng, vice chairman of the Translators Association of China (TAC), meets with Johannes Mengesha, assistant secretary-general for the General Assembly and Conference Management of the UN, on August 4,2008 in Shanghai, China. Tang Wensheng, vice chairman of the Translators Association of China (TAC), met with Johannes Mengesha, assistant secretary-general for the General Assembly and Conference Management of the United Nations, on August 4, just several hours after the 18th FIT World Congress opened in Shanghai at the International Convention Center. During the meeting, Mrs. Tang extended her gratitude to Mr. Mengesha for his keynote speech made in the opening ceremony. The 45-minitue discussion mainly revolved around topics of the translation profession and the training programs pertaining to this field. Tang offered pieces of insightful advice on how to train translation professionals. "The training should meet the needs of the market and tailor itself to different groups of people,"she remarked. Mengesha paid high tribute to TAC for taking painstaking efforts to prepare for the current congress, as well as for the bettering of China's translation industry. He also revealed that the UN will hold a translation test to bring in fresh blood to their talent pool next November in Beijing. In addition, Mengesha talked about translation services in the UN. "For cost concern, the UN has outsourced part of translation services to other countries, including China,"he said. "Other than some confidential and sensitive documents, 20 percent of the translation is outsourced." They also expressed a willingness to cooperate with each other in the near future.